Vitello’s is located in the Chicago area. This is a delicious chocolate cake that is almost flourless. It is rich and can’t be missed. 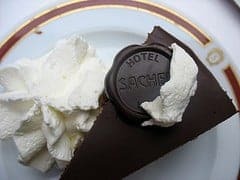 This Vitello’s Bakery Sacher Torte is a rich and decadent dessert. While this is not gluten free, it uses very little flour. Baking this can be slightly challenging. This will not firm up like your everyday chocolate cake. It will have the texture of a cheesecake, but it will be chocolate. You can use semi-sweet chocolate chips for this, you could also use a slightly sweetened baking chocolate like you would get at Trader Joes. This very chocolate cake features a chocolate layer, apricot preserves, and a rich chocolate ganache over it all. For the cake, melt chocolate in a small water bath, you could use about 1/2 cup for the water bath. Be sure that the water does not boil. Add butter and stir until butter is melted and the mixture is smooth. Remove from heat and set aside. Sift together: flour, baking soda, and salt. In a large bowl, beat eggs and vanilla until foamy. Add sugar gradually and continue beating until mixture is thick and lemon-colored and eggs hold a crease, this will take about 5 minutes. Gradually fold in flour mixture alternately with chocolate mixture, mixing after each addition until ingredients are well incorporated. Pour batter into three nine-inch cake pans, which have been buttered and floured. Bake at 350 degrees for 25 minutes, or until done. Allow to cool, and loosen cakes from pans. When completely cool remove from pans and place on a wire rack. Spread 1/2 jar of preserves over one cake layer, and then place the second layer on top. Spread remaining jam over the cake. Top with a third later. And cover the top and sides of the cake with the chocolate glaze. To make the chocolate glaze, heat the chocolate chips and evaporated milk in a saucepan over moderate heat, take care not to scorch the chocolate. You may need to add a little milk if this is too thick. You are right. I made a clarification. I hope it was helpful. You only need the water for the water bath. It would turn the chocolate cake into a mess. This was chocolate heaven! I wasn’t sure about the apricot preserves but the flavor was wonderful!